I hope that every one has had a great weekend, and caught some of that rare sunshine that was peaking out yesterday. I hope that was a sign that spring is on the near horizon, as I am done with winter. I long to play outdoors and go to the park with my two kiddies without having to first adorn a hundred layers which make it difficult to run around and play in. It’s no secret having two under two is hard work. Most of the time it is fully manageable, kinda like having twins, I just do everything twice. When it comes down to having privacy and peace, well you can just about forget it for the next few years. Before I had kids I never imagined how much dignity I would lose, not because of the birth and showing the world your bits, that only last a minute. It was the fact that if I wanted to have good hygiene I was going to have to get used to sharing my shower with my two kids. It was an awkward moment to get used to someone sat there throwing toys at you, giggling, and wanting to play while you suds yourself and wash your hair at the same time. Now, that I have two throwing toys at me, giggling, and wanting to play while I attempt to wash, it has turned into a very ordinary moment. Everyday I put Missy Moo in her swing with a few toys and pull the swing into the bathroom with me, Buba is far too young to trust alone or be left with his sister, so in he comes too, usually with a ball or something to throw in and out of my shower. For some reason they both love this time together, and I too have come to laugh and play back. Life is too short to wish a moment of privacy when you know it is never going to happen. 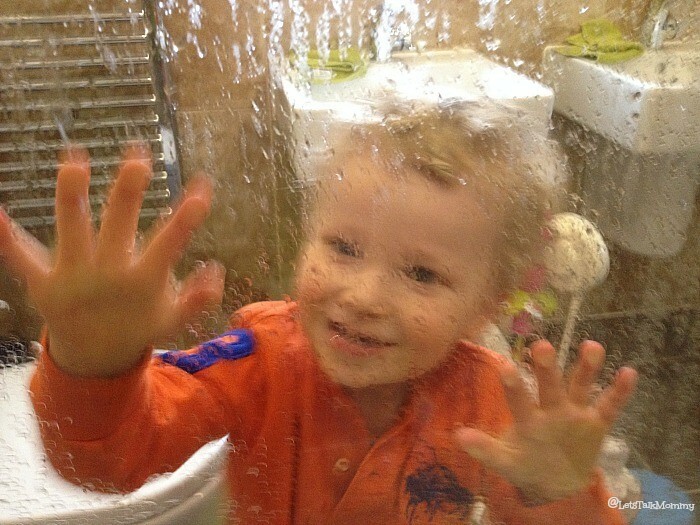 The smile on Buba’s face as I press my face to the shower door glass making funny faces, or when he targets me just right and the ball hits the water and splashes us all, is absolutely priceless. I can’t say it’s not messy, my bathroom is an open wet room so water does get every where!!! Missy Moo looks on in awe of what is going on between her hyper ball throwing brother and her crazy suds-ed up Mommy making fish faces through the glass. Thank you Katie, for reminding us all to cherish the ordinary moments as much as the extraordinary moments. 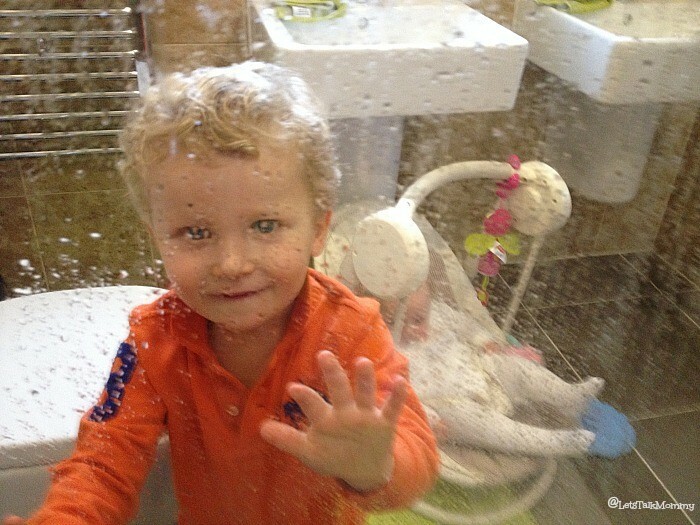 Linking up to “Ordinary Moments” at MummyDaddyandMe. This is such a true depiction of motherhood Jenny! So funny! Thanks Morgana, I thought so. hahaha Never a dull moment in this house! 🙂 Nor a private one! Thank you. I agree I kept thinking at first this is frustrating but then I thought one day I will miss this and them wanting to be with me every moment of every day. 🙂 So I just had to capture it. 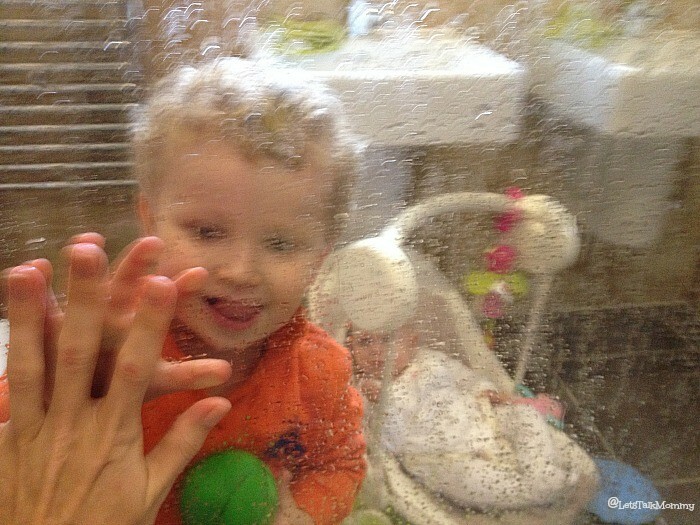 Oh I remember so well the days of having a toddler and a baby in a bouncer just beyond the shower screen! Love your photos, perfect captures of the every day. Oh that’s so sweet – and so very true! Kitty’s not that interested any more but Elma loves to sit on the bathroom floor and pass me ducks while I squint at her from behind the shower screen (no glasses and very short sighted)! hahaha Thanks for your lovely comment, you made me laugh. At first I kept thinking will I ever get a moment of privacy but I know this time will be so short and they won’t want to be with me every second of everyday real soon. So I am embracing it and trying to make the most of each ordinary moment like these. Thanks for commenting and stopping by Carie. very cute pictures!! 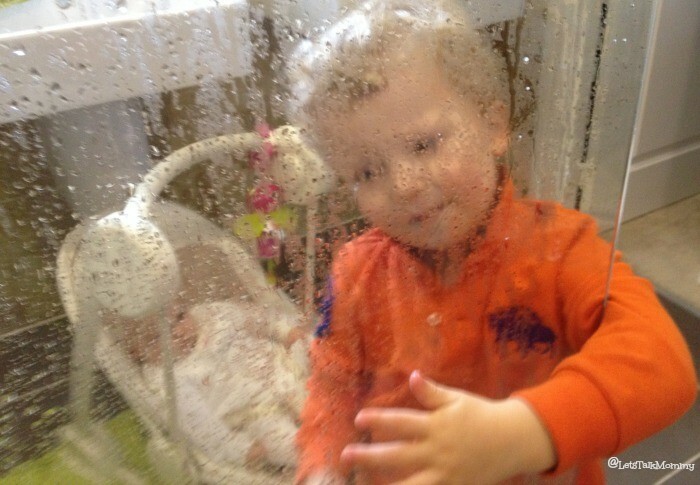 I love the one with your hands touching on the glass, so sweet!